Mark works with the owners of S-corporations, C-corporations, partnerships, LLCs, and individuals with complex tax or financial situations. He works with a wide range of businesses, small and large, including real estate, equine, construction, law firms, and medical practices, to name a few. Income tax planning for optimal results is central to the business consulting Mark offers. After earning his Master of Accountancy (taxation) from Miami University, Mark began his career with the international firm Deloitte & Touche in their Lexington tax department, and then continued practicing with a large local accounting firm in Lexington. Recruited by a client, Mark became a CFO for a group of natural resources companies in southeast Kentucky, where he worked for nine years. After that company was sold, and after a few permutations, his firm evolved into what is today known as Enderle & Romans. The firm has a solid reputation for high quality tax consulting and other accounting services. Mark is a trusted advisor to many business owners, and with his near 30 years of experience, offers advice that business owners seek. He has been involved in many business purchase and sale transactions, including advising on structuring for optimal tax results. Mark is certified in financial forensics, and does a significant amount of work in the business fraud area including fraud prevention, detection and response. He has served as a consultant, an expert witness, and auditor on numerous cases involving fraud allegations. Mark has been a court-appointed receiver and trustee for businesses and individuals. He has testified as an expert witness in various Kentucky courts numerous times on tax and other issues. 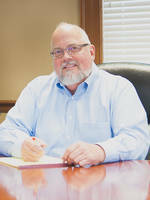 Mark served as an adjunct instructor of tax and other accounting courses at the University of Kentucky, Lexington Community College for thirteen years, and later for six years at Kentucky Community and Technical College System and other local community colleges. In all, he was an adjunct instructor for 23 years. He is a frequent presenter to business groups on a variety of taxation topics. Mark has served as Treasurer of numerous nonprofit boards over the last 30 years in Lexington. He has also served as a campaign treasurer for both city and statewide races.